History and Facts about Canada and provinces in Canada. Canada is the biggest country in North America. It has borders from Atlantic Ocean to Arctic Ocean. It's known that Aboriginal peoples were the first people living in area. Then in the 15th century, French and English colonialists conquered the country. After some wars, country declared Canada Act 1982. Canada’s political structure is parliamentary democracy and constitutional monarchy. Head of state is now Queen Elizabeth II. Population of country is 33.4 million. Canada has territories and provinces. Main difference between them is that provinces take power from Constitution Act, 1867 but territories take power from federal government. There are 10 provinces in Canada. 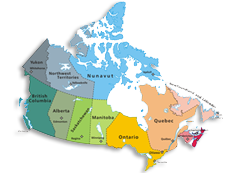 They are Ontario, Quebec, Nova Scotia, New Brunswick, Manitoba, British Columbia, Prince Edward Island, Saskatchewan, Alberta and Newfoundland and Labrador. The biggest province of Canada is Ontario. It’s on the east-central of country. Most populour and capital city Toronto and Canada’s capital Ottawa locates in here. Ontario’s 2,700 km border locates in United States. In the last decades, people calls Ontario on two parts as Northern Ontario and Southern Ontario. Southern Ontario is the main place people choose to live in Ontario. Ontario’s climate is mainly warm. Winter is cold and summer is hot. Scottish, Irish and French migrates mostly choose to live in Ontario. At last census, population of Ontario was 12,851,821. Ontario has a strong economy and it’s the manufacturing capital of Canada. Quebec is the second most populous province in Canada. Capital of province is Quebec City and most populous city is Montreal. Population is 7,903,001 by the last census. Especially people choose Saint Lawrence River borders to live in Quebec. French is the official language of province and it’s only one in Canada. There’s a political movement known as Quebec independence in the Canada’s political life. Canada’s government made referendums about independence but they couldn’t success. Economic power of Quebec comes from natural resources. Also province is developed on biotechnology. People of Quebec mostly speak an accent of French known as Québécois. British Columbia is the third populous province in Canada. British Columbia is the western part of country. Victoria is the capital city of British Columbia province. Also Vancouver is on British Columbia. In the last census, population was 4,419,974. British Columbia’s economy stands on transporting. It has lots of railways and highways going to Pacific ports. Also moderate climate makes the British Columbia an important place for tourism. Most of Canada’s national parks are here. Some of them are Glacier National Park, Mount Revelstoke National Park and Kootenay National Park. Alberta is the fourth most populous province in Canada. It’s population was 3,645,257 in 2011. Province has a little border to U.S. The capital city of Alberta is Edmonton and most populous city is Calgary. Alberta’s climate is the driest one in country. It has cold winters and hot summers. Province is one of the most important dinosaur fossils’ resources in the world. Manitoba is the fifth most populous province in Canada. Population in last census was 1,208,268. Winnipeg is both capital and biggest city of province. Manitoba has a strong economy based on natural resources. Canadian farmland’s 12 percent locates in Manitoba. Nova Scotia is one of the Maritime Provinces in Canada. Their capital city is Halifax. Also New Brunswick and Prince Edward Island are Maritime Provinces. Main cultural influences of provinces come from European settlements. But also it’s possible to see inspirations from historical cultures. Some colonies like British Columbia, Nova Scotia, New Brunswick and Prince Edward Island joined the Canada after some referendums and other censuses. 1) The largest Island in Canada is Baffin Island. It is the fifth biggest island on Earth. Only two US states are bigger than Baffin Island – Alaska and Texas. Baffin Island is more than double the size of the UK and is slightly smaller than France. 2) Canada sources approximately 20 to 30% of the world’s annual uranium output. As such, Canada is the largest producer of natural uranium in the world. 3) Canada is home to the largest freshwater island in the world. Manitoulin Island, in Lake Huron, is the world’s largest island surrounded by freshwater. 4) Canada’s highest mountain is Mount Logan, 5,959 metres (19,551 ft) high. Due to tectonic activity, Mount Logan continues to gain height by an average of a few millimetres each year. Mount Logan is possibly the world’s largest mountain because its overall footprint covers a greater area than any other known mountain massif on Earth. 5) Basketball was invented by a Canadian – Dr. James Naismith. He was born on November 6, 1861 in Ramsay township, near Almonte, Ontario. His mother and father had immigrated to Canada from Scotland. On December 21st 1891, James Naismith’s class of secretaries played the first ever game of basketball. The ball was a soccer ball and the goals were two peach baskets. 6) Canada has more lake area than any other country in the world and so it should come as no surprise that roughly 20 % of the world’s freshwater is to be found in Canada.